To Everyone’s surprise, last Saturday marked the end of Cartoon Network’s Toonami block. While the block had its ups and downs, the block was a pioneer in anime programming in North America. In fact, I remember that on my trips to the United States I would always take the time to catch the latest popular anime on Toonami as YTV didn’t carry a lot of the series they did. Just before S and SuperS were announced on YTV, I remember that I purposely made the family come home early from a shopping trip just to catch it on Toonami. Of course, I had no idea that the episode which had confused me was the end of the S season. Toonami also frequently showed anime movies, even devoting an entire month to Miyazaki movies, something no networks have ever done, save for airing them once in a while. 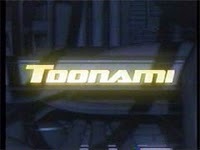 Toonami also strived to have something for everyone of all ages. Though many of their shows were rated for the under 7 set, many of them appealed to older viewers such as DBZ, Sailor Moon, and the Gundam series. In recent years, many fans complained of the lack of variety of “decent” anime on the channels, but suffice to say, many of us would not have known about the series we know and love today if it was not for Toonami. Toonami also had some of the coolest CGI hosts we have ever seen on television. The older generations of TOM, Sara, and Moltar were never live to air (like the Program Jockeys on YTV) but they went a lot farther than some live hosts we have seen. They showed fans’ drawings, video game reviews, and providing an outlet for some very lucky techno and electronica musicians to have their work played between shows. Some music videos even aired. Toonami had become more than just a cartoon block. The network pulled this surprise on nearly everyone, sending around a message of excitement to fans, and then making an official annoucement last Saturday at Anime Weekend Atlanta. Toonami’s Jetstream service will continue, but without the Toonami name. Toonami’s staff will all be working for different areas of Cartoon Network. A new action block will take over Toonami’s spot on Friday nights, but as of this writing we don’t know anything about it. We will let you know as always as soon as you can. This is truly a sad thing that has happened, and we are all really sad to see Toonami go. There will probably never be a block like it ever again in North America. But for all of the blocks recent shortcomings, the show was a major pioneer in bringing anime to the masses in the United States, and its influence will never be forgotten. Fans wanting to relive any old clips from Toonami’s heyday are urged to visit Toonami Arsenal – they even have some old clips from Sailor Moon! More importantly, for those of you who want to catch the farewell montages, Toonami Arsenal has posted them on their front page. This morning, we watched them all and we even marked all the mentions of Sailor Moon in the montages. Montage 4 – 39 sec (It’s hard to tell if that’s Sailor Jupiter or Molly from that angle).